Sherri and I have served eight years in Zambia, a country that is officially over 95% Christian yet where 100 years ago there were hardly any Christians at all. Most of this growth has happened in the last 50 or so years. The church here is dealing with second and third generation issues. On one hand, there’s been amazing numerical success, there are churches and Christian institutions everywhere, and even the constitution declares Zambia to be a Christian nation. But on the other hand, when everyone is supposed to be Christian and righteous and when prestige and power belong to those who control Christian institutions, there’s a challenge to stay supple before God and one another for the sake of ongoing deeper conversion. It can be tempting to focus more on the surface than on being deeply Christian, even at a seminary such as the one where I teach. Yet this year I’ve glimpsed some different and special evidence of softness before God. I’ve witnessed moments of honesty, breakthrough, and surprise. 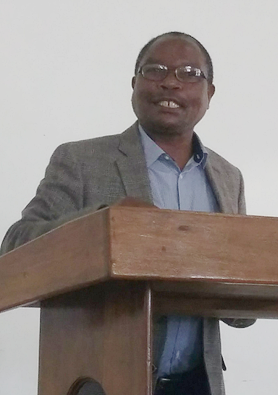 •	Rarely in the past had I heard students or fellow Christian leaders say they felt afraid, or say, “I’m not sure I measure up,” or “I don’t have it all together.” But at the beginning of 2018, we received a new leader at Justo Mwale, Dr. Lukas Soko. The first thing he did in front of our community was to stand and say, “I must be honest and tell you, I’m terrified. It’s so terrifying to be the leader…” He began with honesty and genuineness that made for a holy moment of humbling ourselves before God. •	I have also hardly ever heard someone in Zambia openly say, “I failed” or “I blew it” or show remorse for shortcomings. Yet a student whom I had caught plagiarizing recently came to my office saying, “I know I disappointed you. I’m walking under a shadow. I’m not asking you to change my grade. I’m telling you I feel guilty, and I can’t go on with this guilt.” I responded, “Are you saying you need me to tell you that I forgive you?” “That’s exactly what I’m asking for,” he replied. I was surprised, touched. I told him, “In Jesus’ name I forgive you.” We both left the conversation with joy, feeling the good news of Jesus. •	In Zambia, as in most circles of Christian leaders, there’s a lot of concern to protect one’s reputation. My students tend to be reluctant to share with one another about weaknesses or sin because information might be used against them. I don’t think I had ever heard a public confession of sin. Yet recently a student openly confessed, “I’m addicted …” and he named his addiction openly. Yet there were no signs of judgment in the room, just nodding heads, sympathy – grace. I was encouraged. Honesty, coming into the light instead of freezing up through fear of judgment, feels so important for real Christian formation to happen on our campus. •	Our students tend to struggle in their progress as preachers because it can seem to them that being in a seminary where they are all training as preachers, they need to sound academic and keep about 25 or 30 rules in mind to be responsible for what they call “the Justo Mwale preaching method.” This has a way of sucking the life out of sermons, which then sound like someone reading an academic paper. (I confess I’ve preached some sermons like that as well.) But in a preaching class last term, I shared repeatedly that our Justo Mwale community needed them to preach from their hearts and that they needed to be preparing to preach focused, biblical sermons that speak as much to the heart as to the mind. I then began hearing some of the best student sermons I’ve heard in eight years. It seemed they had been set free to preach deep, moving sermons from the heart. •	In May when preaching in chapel, I found myself saying something in a sermon which I didn’t plan to say. That’s something I don’t do – I stick with what I’ve written in my manuscript. At the time, I was warning students about not going through the motions and not putting on a show as we prepare for a life of ministry. I ended up saying it would be a disaster to be all dressed up in a robe at graduation, looking ready but not really being ready for ministry because they had gone through the motions instead of making their learning real and from the heart. Students seemed appreciative and responsive. One Malawian told me he was particularly touched … and it was by the part of the sermon I hadn’t planned on saying. I feel thankful for unexpected moments of grace and genuineness. Sherri and I and our colleagues work. We can work hard as we seek to be faithful. But for me, these stories are little signs of something larger, signs of God working like little pieces of the kingdom quietly pushing through the soil, sprouting. These may be little signs, but they seem real. God can be trusted to bring his kingdom, to make things happen, and to make things real. Thank you for giving Sherri and me the opportunity to be part of God’s kingdom work in Zambia and at Justo Mwale University. Please keep us and the ministries of Justo Mwale University and the Young Adult Volunteer (YAV) program in your prayers. 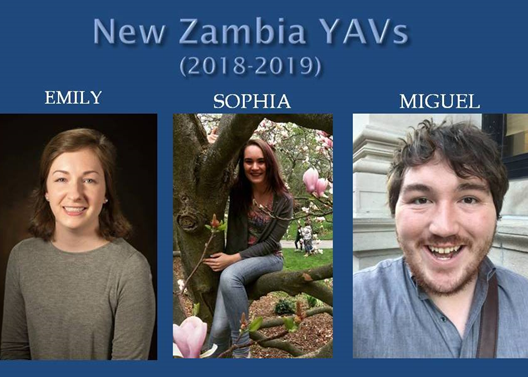 We are expecting three American YAVs in Zambia soon to begin their “Year of Service for a Lifetime of Change.” Please pray for them and Sherri as they prepare and arrive; and during their September in-country orientation; and then for their travel, adjustment, service, and relationships as they go out to the host families and placements where they will spend the bulk of their 11 months in Zambia. Your prayers and gifts sustain our ministry. We are so thankful for your prayers and other forms of care. 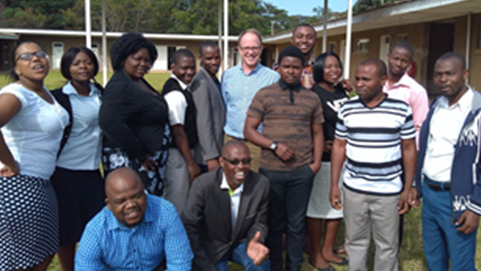 Read more about the Ellington’s ministry HERE and more about Justo Mwale University HERE. The Outreach Foundation is seeking $10,000 for support funds for the Ellingtons and $22,000 for scholarships at Justo Mwale University.